Al Thika Packaging is the exclusive distributor of Markem Imaje in the Middle East. Since 1994 Al Thika Packaging has been supplying traceability equipment, marking printer, coding machine and consumables for food, pharmaceuticals and beverage industries in Dubai, Abu Dhabi, Sharjah, Fujairah, Ras Al Khaimah, Ajman, Umm Al Quwain, Al Ain – UAE, Saudi Arabia, Kuwait, Bahrain, Oman and the many other Gulf countries. Wide print area 128 mm x 150 mm maximum to print large messages at 2x the variable print format capacity, eliminating need for additional printers. Ability to print multiple codes on multi-lane packaging lines. 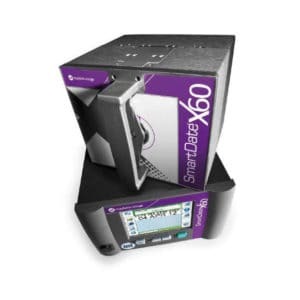 Firmware enhancements include dead dot detection and image adjustment for fast, easy changes directly from simple USB-connectable touch screen user interface. 900 meter ribbon available in select grades for improved uptime. Robust design with no wear parts, requiring zero preventive maintenance.